This is our membership page. All you need to join the African Violet Society of Canada is right here. You can download the membership form, which can be printed on your computer's printer. You can then complete this one by hand and mail it with your payment to the address on the form. Our membership application is also conveniently located on every copy of our African violet culture folder. Just click on AVSC Basic African Violet Culture Folder to obtain your copy of the folder with the convenient membership application form. * a subscription to Chatter, our magazine which is published four times a year. For more information on this publication click on Chatter. Download your free issue of Chatter now! We are offering our web site visitors an opportunity to read a free copy of the October-December 2012 issue of Chatter in PDF format. With your yearly AVSC membership, you will receive four printed issues of Chatter by mail. Join our growing International family and connect with AVSC members from Canada, U.S, England, Japan, Russia, Hong Kong and Australia. Just click here: Chatter October-December 2012 and you can start reading articles that are usually seen only by our AVSC members. We would be happy to send you a fresh hard copy of Chatter four times a year. All you need do is join AVSC as a member. * the opportunity to attend our annual Convention & Show which travels around the country. In 2001 it was in Longueuil, Québec; in 2002 it was in Calgary, Alberta and in 2003 it was in Mississauga, Ontario, near Toronto. Our 2005 location was Edmonton, Alberta and 2006 was Ottawa, Ontario. In 2007 we returned to Mississauga and in 2009 we were back in Calgary. The Convention is hosted each year by one of our local affiliates. They bid for the privilege of hosting. Occasionally we have to skip a year and in 2004 and 2008 we had no Convention. After skipping 2008, we were happy to go to Calgary for our 2009 Convention. In 2010 we enjoyed Toronto again as guests of Lakeshore African Violet Society at Sherway Gardens and the Old Mill Inn. 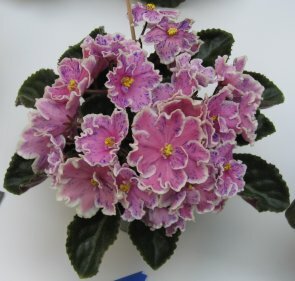 In 2012 we had a joint convention and show with the African Violet Society of America, Inc. in Detroit. This was an exciting new, international venture. In 2014 we were back in Toronto as guests of the Toronto African Violet Society. We have Calgary in our sights for 2016. * opportunities to meet and share information with literally hundreds of other African violet enthusiasts across the country. We would love to welcome you to the group! Basic membership costs just $20.00 per year. There are savings if you buy more than one year's membership at a time. There are also a special rate for family membership (two members, one subscription to Chatter) and special U.S.A. and International rates only slightly higher than the basic rate to cover additional mailing costs. Splatter Kake is a very striking plant. It has bright pink blossoms with white edges and purple fantasy markings. Joining AVSC and meeting others interested in African violets will give you greater access to some of these unusual varieties.